Late last year, while on assignment in northern NSW for Bicycling Australia magazine, I had the great pleasure of spending a pleasant morning with Moree cycling doyen Sonny Clissold. Some of our chat made it into the magazine. But a lot of great yarns about the country cycling scene didn’t. Rather than be lost forever, figured it was well worth sharing Sonny’s tales of country roads, bush velodromes and con men. Hope you like it. A horseman who spent his early years on the rodeo circuit, he swears he’s never ridden a bicycle in his life. But you’d be hard-pressed to find a more influential figure in the proud history of regional NSW cycling than the man whose Moree backyard I’m sitting in right now, flanked by the family dog and a triumvirate of garden statues painted to resemble past local champions Gary Sutton, Shane Sutton and ex-national champion, John Clissold, who also happens to be his son. Truth be told, as something of a late-comer to cycling I’d not heard of Sonny Clissold before venturing to north-western NSW in the lead-up to the 2014 Grafton to Inverell Classic. Whilst photographing the town’s sadly-dilapidated velodrome for a completely different story, I stumbled upon his nephew Jamie whose own kids were there testing new bikes on the BMX track which now occupies the infield. We got talking, as you do in the country, and before I knew it Sonny was on the phone inviting me around for a cup of tea and a chinwag. 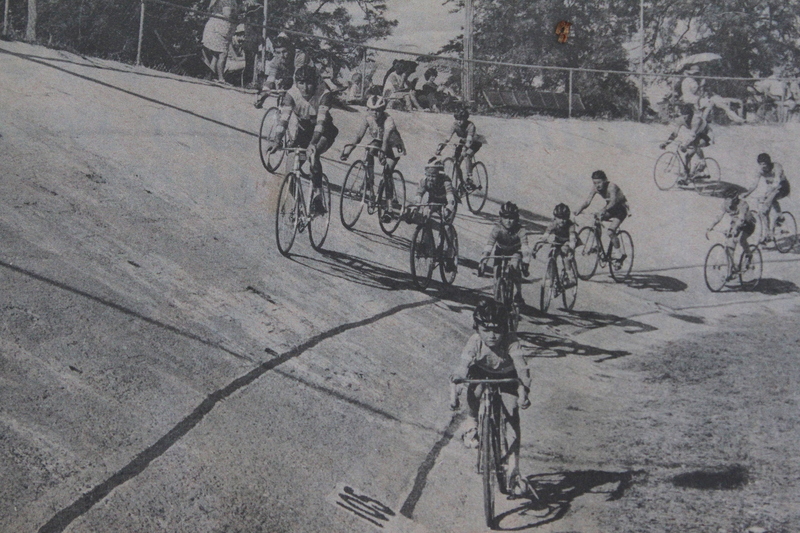 The ill-fated Moree velodrome in its hey day. Sadly overgrown and dilapidated for many years, its infield is now used as a BMX track. The next morning I duly obliged and quickly realised I was in the company of one of Australian cycling’s 20th Century treasures; a 21-year Life Member of the original Moree Cycling Club with a gravely voice, sun-weathered skin and remarkable array of knowledge gleaned from decades involved on both the boards and tarmac. He may be getting on in years, but this man has a memory like a steel trap and could, no doubt, talk under the artesian water for which his town is famous. Carbon Addiction: Everyone thinks of the Sutton boys when they think of Moree. But your son, John, was also a National Champion, is that right? Sonny Clissold: That’s right. Johnny was actually the first Moree bloke riding for Moree to win a National Title. He won it down in Adelaide. He also rode in Europe. He lives in Tamworth now, he’s got a business there. CA: Do you remember Johnny racing against the Suttons in the local velodrome? There’s my young bloke holding the trophy when he won his first national title. There’s Gary with the World Champion’s colours and there’s Shane. Actually he’s coming back at Christmas when he brings the Poms to Perth (Shane Sutton has worked with British Cycling since 2002 and is now Technical Director). He hasn’t been home for two years. Originally he went over there to ride the Milk Race; he won it in 1990. His father died when he was away riding. CA: I’m curious how someone with pretty much no cycling pedigree could become so deeply entwined in the sport? SC: (laughs) Well that’s right. I was always a horseman. My wife Fay and I travelled a lot to rodeos. The first cycling carnival I ever went to was in 1960 when I took Gary Sutton up to Gilgai. I remember thinking how bloody stupid are these blokes, they just get on and pedal their guts out, there’s no brains in this. Then for some reason I went to another carnival and another, and now I’ve been all over Australia doing it and I just love it. It’s incredible what a bike rider can do. You make a run or tackle a bloke playing football and you can walk back and have blow for a while. But you get out on this flat country, or anywhere for that matter, and stop pedalling and see how far you get. It’s such a tough game. They’re nowhere near as tough now as they were, mind you. It will never be like that again. CA: You coached some of the country’s finest riders at different stages of their careers. How did you first get involved in that side of things? SC: Years ago I was speaking with a bloke called John Archman one night from the Institute of Sport in Canberra. He was telling me he had a team of juveniles who were heading to Calga near Sydney for the team time trials. He said there’s not a team that could beat them in Australia. I’d had a few drinks at that stage and said ‘Well, I’ll get a heap of bushies to go down there and beat you’. Fay said to me the next morning, ‘do you know what you said to John?’ I couldn’t remember so she told me. I got on the phone and within three days I had five country kids – from Coffs Harbour, Grafton, Port Macquarie, here – but what we had to do is all be from one club, so we joined Inverell. I stayed a Moree man, mind you. I’m a 21-year Life Member of Moree. Anyway, we went down to Calga and beat John’s team. I took them back the next year and we won again. John used to say ‘how do you do it?’ If you get a rider to believe in you, and believe in themselves, they can do anything. I used to get the Tina Turner records out. ‘Simply the Best’. CA: Your nephew Jamie was telling me Steel was probably the most talented of the Sutton boys, but he didn’t always have the best attitude. Is that how you saw it? SC: Yeah, I think so. Steel actually used to live with us here. I remember he rode the Worlds one year, came home and said ‘Unc, I’m finished.’ He didn’t have that same hunger like Gary. They’d come home at Christmas time and we’d all get together. We’d have a table tennis tournament and a little cup. Gary just had to win. He was unbelievably competitive. CA: What if he didn’t win? SC: He was always a great sportsman. Playing marbles, he had to win. He was a winner, full stop. But if he got beaten, he just took it. CA: Did they get away with it? SC: Of course! They always got away with it. Shane was such a con man. The other thing we used to do was get them to put a rock on a particular post out there along the highway, so we’d know if they actually done the work. CA: Ever do any motor pacing with your motorbike? SC: All the time. Mainly out to Warialda. I actually had some signs put up on the highway with the local member here, Wal Murray (ex-NSW Deputy Premier), but they’ve pulled them all down nowadays. CA: Those really were the halcyon days for Moree cycling back in the 1970s. Were you heavily involved with the original club? SC: My word, especially at Easter time. It was the last carnival on the track circuit each season and everyone used to come here. What we’d do is run all our heats on a Saturday and the final scratch race on the Saturday night. All the other finals were on the Sunday. We’d put 5,000 people in that old velodrome. It was pretty special. Just two of the hundreds of news clippings Clissold and his wife have collected over the years. CA: Was there a name for the big races? SC: There was bloke by the name of Tommy Blackburn, he was an electrician here in Moree. When things really got going we put lights right around the velodrome. I came home one night and my mate said all the lights were broken. I was like ‘what are we going to do? We’ve got no money and we’ve got to have the trophies.’ So I went and saw Tommy and his wife. I said ‘Mrs Blackburn I’ll be quite truthful with you, we’ve got no money.’ I said we could only pay after the carnival. She said, ‘I’ve known you all your life Sonny, you’ve always been honest, this is a donation.’ Tommy took over the scratch race, and when his wife died it became a memorium. There was some great racing on that track, six to the mile. Gary was never beaten on it. Geoff Skaines came from here as well – ‘Ocker’ as we called him – but Gary always had his measure. I’ve known them both since they were kids. Ocker would go out and ride a better qualifying time than Gary in the pursuit. But every time they’d meet, man-to-man, Gary would smack his bum. There’s another guy from here too, Noel Mathiske. I only spoke with him last night, he’s got cancer. He’s down in Taree running a bike shop. He’s the only rider apart from Gary Sutton to ever win three straight Australian Schoolboys titles. CA: There were two Mathiske boys weren’t there? SC: Yes, Noel and Louie. Louie is up on the Gold Coast. He designs bikes, I think Merckx has taken a couple of them this year. Doesn’t surprise me, anything those kids did was always absolutely perfect. Noel was married twice, we used to call them the Brady Bunch. His two sons are fantastic riders as well. CA: There’s such a rich cycling history in this town. Having been part the golden age of cycling in Moree do you feel a bit sad seeing what it’s like today, a shadow of its former self? SC: No, I don’t feel sad. It will never get back to what it was – cycling has changed. But I still go to a lot of bike carnivals. And you’d be surprised the amount of people who still ring me to say hello and have a chat. I’ve got more friends in bikes around the country than I have in my own town. The Hall of Fame in the Moree Services Club. CA: Who’s the best cyclist to come out of this part of the world? SC: Oh, Gary. He was easily the toughest. But not the smartest. Shane was smarter. I remember once we had a point score in the town’s velodrome, a memorium for my dad. On the Saturday Gary was three points in front, and it was four points for a win. Well, his sister rang me up and said ‘you better come and get Shane’. I asked what was wrong and she said ‘he’s sick’. I went round and said ‘Shane, you’ve got to ride mate, the whole town’s going to be there tonight to watch you – you could not move in that velodrome, everyone was standing around the outside. So I said, ‘I tell you what I’ll do mate, I’ll set it up for you.’ In the final it was Kevvy Nichols, he was an Olympian, Wayne Nichols, he was an Olympian, Ocker (Geoff Skaines), Shane and Gary. I said, ‘with three to go, Gary is going to go, I want you on his wheel, don’t do a dirty. He said, righto mate.’ So with three to go Shane’s on his wheel alright, he $#@% beat Gary by a whisker and they got off and fought in the middle of the velodrome! Shane’s always been a con man. I’ve seen him in sprints grab the knickers of another bloke and pull them down under the seat. Such a smart bike rider. CA: I suppose that’s why he’s doing what he’s doing now with British Cycling. SC: That’s right. I went to the Track World Championships when the Poms won the team pursuit a few years ago in Melbourne. I saw Shane afterwards and said ‘I suppose the boys will be out on the town tonight?’ He said ‘they’ll be on the plane tomorrow if they do’. It’s a business these days. He’s been invited to Buckingham Palace, you know, for a cup of tea with the Queen. He even has an OBE. Not bad for a kid from the black soil country of Moree. CA: I guess he must have had a good mentor? SC: Yeah, maybe he did (laughs). Must be a priviledge to meet and interview such people. It’s a shame cyclings history is not better known. I love it Stu, and yes, I am fortunate to hear these kind of stories. Best part of what I do…chatting about cycling with interesting people. Well done Pete, awesome to hear these stories….. Unfortunately the moree cyclle track refurbishment was undertaken and supervised by an engineer with no concept on how the surface was required. It fell apart. The easter carnival of sport and cycling was a main attraction to moree. After the cycling on sunday night the st george cycle team , sutton nichols etc all partied at the criterion hotel. Doreen was the chef and no problems there. From memory we partied on until 4 or 5am. The boys jumped on the bus a few hours later for the return to sydney. The hotel opened for business at midday and closed at 1pm. Neither Billy Petscheler or the publican was well enough to man the bar. Mrs sutton often had cause to wonder the goings on on weekends at the Cri.1976/1977/1978. Kelly Humphries, still a moree resident, can tell the tale. Have a good day. A brilliant bloke , worked with Sonny for a few years, like it’s been said, he has a fantastic memory.